Mr. Ball’s egg-cellent adventure just may leave him cracked. Mr. Ball, a big, yellow smiling ball with short arms and legs, and his friends, a hen, a turtle and Dr. Dog, along with Mr. Ball’s pet cat, Ms. Kitty Cow, head off to the circus. Mr. Ball is hoping for some wild, scary entertainment; he is unimpressed until the lion tamer steps into the ring. Everyone’s sad when the circus ends, so they decide to hold their own. Each picks an act to perform. Mr. Ball decides he’ll trap and tame a fire-breathing “tweety blob” bird, despite his friends’ warnings. When he is trapped in the tweety blob’s nest by a mama bird who thinks he’s one of her babies, Mr. Ball needs his friends to rescue him. Good thing Ms. Kitty Cow is there to “Moo-ow!” for help. 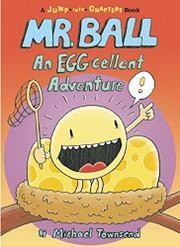 Townsend’s first Mr. Ball adventure stretches over four chapters, plus prologue and afterword. It’s told in graphic panels with easy-to-read narrative captions. Visual gags in the panels and simple, declarative sentences will encourage repeat readings. The chewed-up worms at feeding time in the nest and the many pie fights won’t hurt re-readability either.